I like big bundts and I can not lie! Oh happy day, the day I bought a bundt pan. What is it about a cake in a round circle with deep crevasses and a hole in the middle? It’s still just cake (ok, no cake is just cake, its always OMG CAKE! to me). But, it’s like a giant donut cake with grooves to hold all the icing! Donuts, my Achilles heel. I’m pretty sure you’re not supposed to tell people what your Achilles heel is, but we’ve already established that I’d be a sucky superhero. I’m also pretty sure that I’ve stated I don’t like cream cheese, and yet, it keeps winding up in my desserts. I guess as long as cream cheese is combine with sugar I’m okay with it. But it can’t be on its own, like a cheesecake. Ew. Yes, I’m from Wisconsin and I don’t like cheesecake. I don’t think they actually make cream cheese in Wisconsin anyway, so my feelings might be socially acceptable in the great white North. 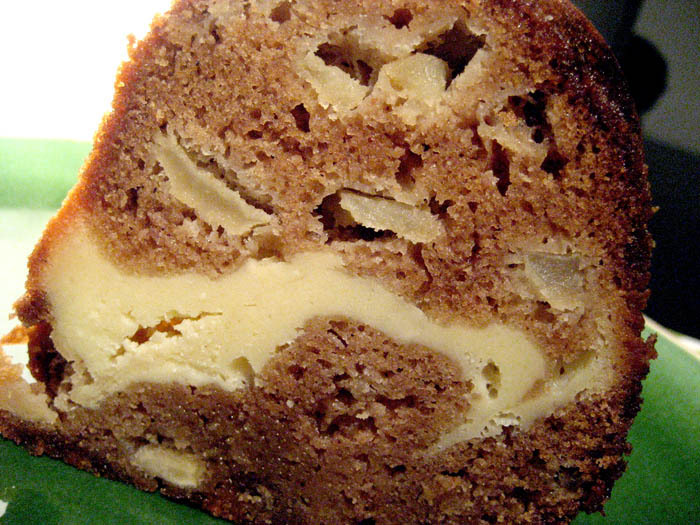 No, if cream cheese is to be in a Hungry Redhead dessert it will be as an icing or mixed in with another flavor, as is the case with this apple and cream cheese swirl bundt cake. Maybe it’s the chunks of apples and cinnamon, but this bundt cake feels like it could be a coffee cake. 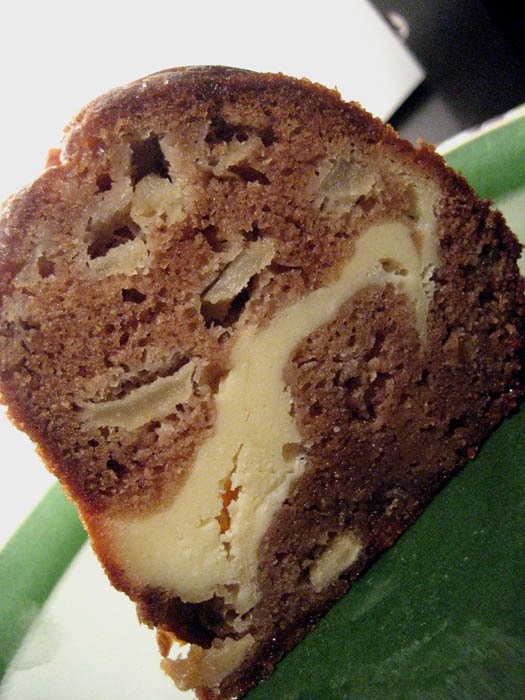 Except, instead of the cinnamon strudel swirl, you have a cream cheese swirl. Swirls are pretty. People like to eat swirls. If you want to go all crazy Southern, you can ice this with a praline frosting, which is included in the link to the original recipe. I, however, don’t like praline, so I left that out. I’ve only been Southern for two years. I guess this post is becoming more about what I don’t like then what I like. But I do like this bundt! I can’t lie! Preheat oven to 350 F. Spray a 12 or 14 cup bundt pan with nonstick cooking spray with flour (the cake will fit in a 12-cup bundt, but just barely). Place the pecans on a rimmed baking sheet and toast in the oven for 8-10 minutes, or just until fragrant. Remove the pan to a wire rack. In a large bowl, whisk the flour, both sugars, the cinnamon, salt, baking soda, nutmeg and allspice together. Add the eggs, oil, applesauce and vanilla and mix just until combined. Fold in the toasted pecans and chopped apples until distributed throughout the batter. Spoon about 1/2 to 2/3 of the cake batter into the prepared pan. Top evenly with the cream cheese filling, leaving a 1-inch border around the edge of the pan (I couldn’t pull that part off, but it still worked. The problem is if you have a thick layer of cream cheese all the way across, the cake will fall apart when you slice it). Use a thin paring knife to swirl the cream cheese filling with the cake batter just a few times – less is more. Top the filling with the remaining cake batter.